Hard to believe, but it’s been almost a decade since Robert Zemeckis, the tech-whiz mastermind behind whimsical popcorn confections like Forrest Gump, Contact, Romancing the Stone, Who Framed Roger Rabbit and the Back to the Future series, has made a film with flesh-and-blood humans on-screen. No, rather, the Oscar-winning director has been toiling in his secret equipment-packed lair, like a classic Universal Horror mad scientist, concocting crazy experiments utilizing motion-capture technology. The process, wherein an actor’s recorded movements are translated into 1s and 0s and pasted onto a computer-generated character, has been hit or miss and inspired rigorous debate over whether the talented auteur’s determined vision is misguided and Quixotic or legitimately important and revolutionary. Phase 1 of Zemeckis’ mo-cap trials led to the unpleasantly synthetic The Polar Express, an adaptation of Chris Van Allsburg’s beloved picture book, which mistook stomach- churning rollercoaster rides and creepy vacant-eyed children for fanciful holiday fun. However, despite its considerable narrative failings, the movie was a box-office smash, which, of course, led to Phase 2: Beowulf, a balls-to-the-wall take on the classic medieval poem. That hearty picture, while uneven and a mite unfocused in the mid-sections, was saved by the director’s aptitude for outlandish, demented violence and show-stopping images (Who can forget the ambitious dragon battle and even more epic naked CG Angelina Jolie?). 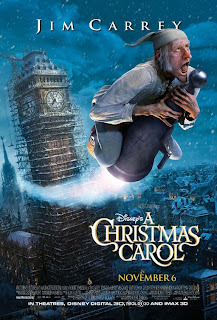 Now, to bring things full circle, the director has returned to the yuletide season for inspiration with the Jim Carrey- headlining A Christmas Carol, a visually striking tribute to Charles Dickens’ 1843 novella, which is surprisingly faithful in both look and vernacular to the original work’s chilly Victorian origins. Make no mistake, despite the Disney-approved family-friendly marketing push, this is a bleak and frightening film, destined to haunt the dreams of sensitive children for many, many winter nights to come. Yet, despite the reputation and influence of its forebears, this 2009 film version stands confidently on its own two sp indly legs, bravely driving its narrative into refreshingly gloomy places. This Scrooge isn’t quite as comically exaggerated as those we’ve seen before; a sinister stooped-over wraith-like man, who, as the film opens, greedily snatches the coins from the eyes of Marley’s rigid corpse. As imposingly embodied by Carrey, this Ebenezer is a true personification of ugliness, all insect-like sharp angles, who fully deserves every moment of torment he undergoes. Thankfully, his suffering is made bearable for the audience by the rich, magnificent artistry of the film’s animation team, who have exhaustively recreated the crumbling co bblestones and pointed spires of early nineteenth century London. As well, they’ve given each supernatural encounter its own distinctive horrific mood. 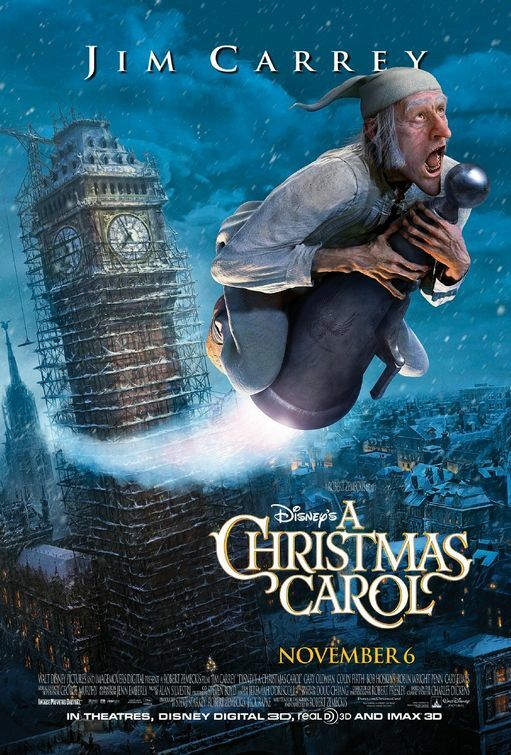 The appearance of Marley’s apparition is an anxiety-tingling exercise in cold, sweaty dread, full of heavy, clanking chains and decaying body parts, while Scrooge’s flights over the gloomy cityscape with the ghosts of Christmas Past and Present are exhilarating feasts for the eyes. 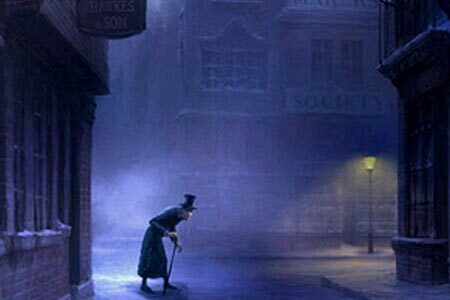 Only the Ghost of Christmas Yet to Come underwhelms, with Scrooge’s wrenching descent into hell delayed in favour of a silly and unnecessarily long chase scene. In fact, the director is so intent on revelling in the mournful and macabre that he tends to short-change the emotion of h is protagonist’s gradually unearthed humanity. Flashbacks to Scrooge’s youth are merely touched upon, with treasured figures like Fezziwig (Bob Hoskins) and his former beloved Belle (Robin Wright Penn) merely touched upon. Only the muted hopefulness of the Cratchit household really connects, mostly due to Gary Oldman’s sensitive and compassionate performance work. 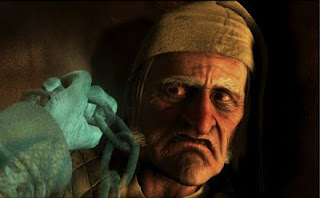 Although there is still considerable ground to cover in regards to mo-cap filmmaking – aside from Scrooge, most of the characters’ eyes are a tad blank – A Christmas Carol is t he first of Zemeckis’ computer-animated features to show distinct traces of a soul. Whether it has the staying power to remain a seasonal staple remains to be seen but it’s a darkly beautiful Gothic bedtime tale that is the ideal cinematic Christmas present to sneak an early peek at. Just remember to ask for some 3D glasses with it. *Originally printed in SFU's The Peak: Nov. 15th, 2009.